Keyword research is one of the most important steps of any online marketing effort. It can be used to increase the SEO of your website, as well as improving everything from online ads to social media posts. If you don’t pick the correct keywords to target, however, all that research will largely be wasted. In this article, we will discuss how you can remove poor performing keywords from your lists and focus on the keywords that will help you meet your marketing goals. 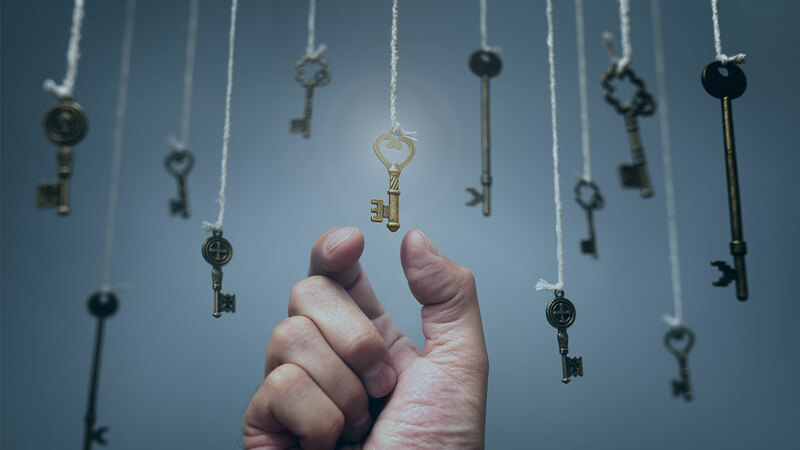 If you are unfamiliar with how to build keyword lists in the first place, check out our post on building keyword lists. At this point, you should have a fairly extensive lists of keywords; each built from one main topic. To help us narrow down these lists and focus on valuable keywords will require the help of a few tools, the first of which is Google’s Keyword Planner tool. Keyword Planner is a free tool that Google includes with Adwords, their advertising platform. If you don’t already have an Adwords account, it is worth signing up for this tool alone. Signing up does not commit you to advertise with Google, although you will have to enter your payment information before you can use Keyword Planner. Once you are logged into Adwords, Keyword Planner can be found by first logging in to your Google Adwords account. On the topside menu of Adwords you will notice an icon made up of three vertical dots. Click that icon, then under the “Planning” heading, click “Keyword Planner”. Search for new keywords using a phrase, website or category. Get search volume data and trends. Multiply keyword lists to get new ideas. To help us determine the value of our keywords we will focus on the second tool; “Get search volume data and trends”. After selecting this option, you are able to enter all of the keywords whose value you want to assess. You are also able to bulk upload keywords from a CSV, TSV or text file. Once you’ve entered all of your keywords, click “Get search volume”. All of your keywords will now be listed with their average search volumes, competition level and suggested bids. This is quite simply the average amount of times that consumers search for each keyword per month. If you only want to see search data for your marketplace you are able to change the target location in the “Targeting” area on the top left side of the results page. Competition gives you an idea of how many advertisers on Adwords are bidding on that particular keyword. Depending on their level of competition, each keyword will be given a rating of either “Low”, “Medium” or “High”. The higher the competition level is for a keyword, the more advertisers are bidding on it. Advertisers will generally not waste their money bidding on a keyword that doesn’t get results so keywords with a “High” level of competition are generally pretty valuable. Suggested bid in particular is useful for assessing the worth of a keyword. It is an approximation of what advertisers on Adwords are paying for ad clicks on that keyword. If others are willing to pay a high price for a keyword it’s usually because that keyword generates a lot of business for them. Once you know the search volume, competition level and average cost per click of your keywords you can begin cross some of them off of your list. Consider dropping any keywords with low search volumes and low competition. Keywords like these rarely convert into sales and don’t provide a lot of website traffic. Another useful tool for assessing keyword value is Google Trends. This is a free tool that allows you to input search terms and see how their search volumes have changed over time. It also lets you see how closely related topics and keywords are trending. A graph from Google Trends showing the popularity of a keyword over the last 5 years. Look for keywords that currently have relatively low competition but are trending upwards in search volume. A low-volume keyword experiencing a big boost in search volume could be the next big trend in your industry! Likewise, if any of your keyword’s search volumes are decreasing with time you should consider dropping them from your list. While they may be valuable now, over time they will become less and less valuable. Now that you have narrowed down your keyword lists a little bit, it is time to start organizing them a bit. One of the most common ways to do this is to separate your keywords into “buying intent lists”. These lists are a way to judge how likely a consumer searching for a given keyword phrase is to make a purchase. 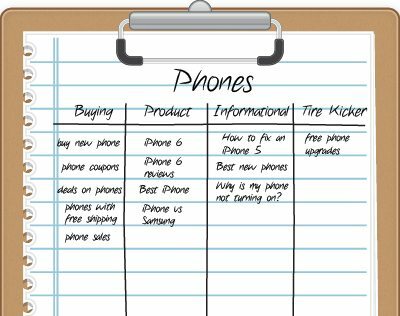 To do this we will separate our lists into buying keywords, product specific keywords, informational keywords and tire kicker keywords. Buying keywords are generally the most desirable as the searcher is ready to buy right now. Since they are so desirable they also tend to have the most competition. Buying keywords phrases typically include words like “buy”, “coupon”, “deal”, “discount”, “sale” and “free shipping”. Product specific keywords are directly related to a product. Consumers searching for these are looking for information about a specific product, service or brand. Their keyword phrases typically include words like “review”, “best”, “top 10”, “comparison” as well as brand or product names (Nike, Apple, Air Jordan, iPhone, etc). Informational keywords make up the majority of keyword phrases. They come from consumers that haven’t yet narrowed down what they need. Informational searches don’t convert as well as buying or product specific searches but shouldn’t be completely ignored. An informational keyword phrase with a high search volume can generate a ton of leads. Informational keyword phrases include phrases like “how to”, “why does” and “best way to”. Tire kicker keywords include words like “free”, “download”, “pdf” and “torrent”. Consumers searching these phrases have no intention of buying anything. You should remove any tire kicker keywords from your list. If you want to increase your website traffic then you should target keywords with high search volumes, right? This is not always the case. Since they provide a lot of web traffic, large volume keywords are targeted by large websites. This makes them extremely hard for small business websites to rank for. Your best bet is to instead focus on high value long-tail keywords with a low to medium search volume. Since these keywords have less search volume than head terms, they also have less competition. This gives your website it’s own niche that it can dominate. The exact keywords you choose will also be influenced by the overall objectives of your website. An e-commerce website, for instance, should target as many buying and product specific keywords as possible. A blog, on the other hand, would be better off building its content around informational keywords. If you are building an ad campaign with the goal of increasing sales, the keywords that you choose to target will typically be determined by your budget. While large companies have the luxury of equally large advertising budgets, small businesses rarely can say the same. To spend your advertising dollars effectively, you should focus on long-tail keywords. Long-tail keywords have a much higher conversion rate than head terms as the consumers searching for them are typically farther down the sales cycle. The keywords that you target should be a mix of buying keywords and product specific keywords since these convert the best. Informational keywords have much lower conversion rates and are very hard to advertise profitably if your goal is to increase sales. If you are running an ad campaign with the goal of increasing your brand awareness, you want to focus on keywords with higher search volumes. Targeting informational keywords will usually give you the best results as they are searched much more often than buying and product specific keywords are. Given their low conversion rates, informational keywords are also typically cheaper to bid on. Keyword research vital to the online success of small businesses. One of the most important parts of keyword research is assessing keyword the value of the keywords in your lists. Targeting valuable keywords can be the difference between a successful advertising campaign and an unsuccessful one. It also has a big impact on how your website will rank on search results pages and who ends up finding your website. Targeting valuable keywords will bring qualified traffic interested in what you’re selling. Targeting the wrong keywords can mean less than optimal traffic finding your site. Tired of guessing how to market your business online? Get a free digital marketing report card from Lure Marketing! We will analyze your current digital marketing efforts and provide you with a detailed list of recommendations for how you can improve them.